Here’s a question for you all: how will you know when you are no longer young? When you fall out of love with contemporary popular music perhaps, or start to find the idea of a cruise holiday attractive? The surefire sign for many people is having to ask a teenager how a piece of technology works — this is probably not that applicable to most Hackaday readers. How about when you’re shocked to encounter a significant part of your youth in a museum? These are supposed to be places of The Olden Days, full of rustic agricultural tools or Neolithic pottery, yet here you are in front of your teenage years presented for all to see. You have two choices: you can surrender to the inevitable and henceforth only wear beige clothing, take up golf or maybe book that old person’s cruise holiday, or you can dive in misty-eyed and reacquaint yourself with everything in front of you. For the visitor this means that their galleries contain a huge array of computing and associated equipment, many of which are presented as working exhibits without too much of the dumbing-down that pervades so many other museums, and that the staff are extremely knowledgable about them. The museum is housed in one of the groups of wartime codebreakers’ huts, laid out roughly in the shape of a capital H with the top of one vertical lopped off. If you are a connoisseur of British wartime sites you’ll recognise these buildings, they were built to a fairly standard design all over the country. Internally this means that the galleries are structured around the long corridors that are a staple of that era, giving in particular the earlier exhibits a feel of their time. When the story of an invention is repeated as Received Opinion for the younger generation it is so often presented as a single one-off event, with a named inventor. Before the event there was no invention, then as if by magic it was there. That apple falling on Isaac Newton’s head, or Archimedes overflowing his bath, you’ve heard the stories. The inventor’s name will sometimes differ depending on which country you are in when you hear the story, which provides an insight into the flaws in the simple invention tales. The truth is in so many cases an invention does not have a single Eureka moment, instead the named inventor builds on the work of so many others who have gone before and is the lucky engineer or scientist whose ideas result in the magic breakthrough before anyone else’s. The history of computing is no exception, with many steps along the path that has given us the devices we rely on for so much today. Blaise Pascal’s 17th century French mechanical calculator, Charles Babbage and Ada, Countess Lovelace’s work in 19th century Britain, Herman Hollerith’s American tabulators at the end of that century, or Konrad Zuse’s work in prewar Germany represent just a few of them. So if we are to search for an inventor in this field we have to be a little more specific than “Who invented the first computer?”, because there are so many candidates. If we restrict the question to “Who invented the first programmable electronic digital computer?” we have a much simpler answer, because we have ample evidence of the machine in question. The Received Opinion answer is therefore “The first programmable electronic digital computer was Colossus, invented at Bletchley Park in World War Two by Alan Turing to break the Nazi Enigma codes, and it was kept secret until the 1970s”. It’s such a temptingly perfect soundbite laden with pluck and derring-do that could so easily be taken from a 1950s Eagle comic, isn’t it. Unfortunately it contains such significant untruths as to be rendered useless. Colossus is the computer you are looking for, it was developed in World War Two and kept secret for many years afterwards, but the rest of the Received Opinion answer is false. It wasn’t invented at Bletchley, its job was not the Enigma work, and most surprisingly Alan Turing’s direct involvement was only peripheral. The real story is much more interesting. 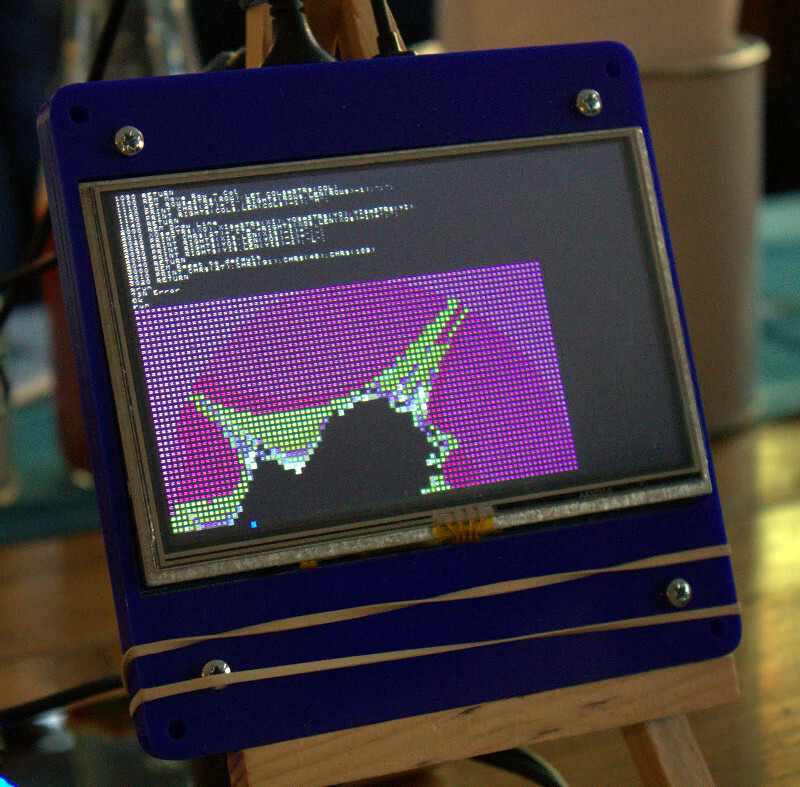 We’ve been all over the UK this month, our most recent Hackaday gathering just two nights past. With much hardware and hacker show and tell (recounted below) I wanted to make sure nobody missed the chance to join in as we’ll be in Bletchley on Saturday and in Cambridge on Wednesday. Whether you need more convincing to walk out the door and join in the fun, or just want to the see the excellent hardware so far displayed, keep reading to share in the fun from Wednesday night. London pubs have an unfavourable image among provincial folk, one of being strange neon-lit places populated by vast crowds of very loud people in suits drinking cheap wine at expensive prices. The truth is though that the capital’s pubs are as diverse as those anywhere else in the country, from shabby quiet backstreet boozers with their aged customers nursing pints of Fullers to achingly hipster faux-Victorian gin-palaces in which young men sporting preposterous beards they’ll regret in five years time drink microbrewery ales you won’t have heard of served in glass tankards. On a hot August evening the patrons spill out onto the pavement and provide a handy reference to the would-be drinker as to the nature of the establishment. This warm-evening exodus served our community well night before last, for when a group of Hackaday readers and Tindie sellers converged upon a pub in Fitzrovia there was enough room to reach the bar and though it was hardly quiet we could at least discuss the things we’d brought along. My colleague [Jasmine] had organised the event and was on hand with a pile of stickers and other swag. A select group of hackers and makers made the journey. Some of them, such as my friend [David], I had encountered frequently online but never met in person so it was good to put a face to a name, while others I knew only by the reputation they had garnered through the projects they’d put on Hackaday.io or Tindie. I will undoubtedly fail to mention a few names in this quick round-up of a few of the projects, so before I start I would like to thank everyone for coming along and making it such a good evening. [Jasmine] as seen by [Mike]’s LED screen. Most visible because of an extensive range of very bright LED projects was [Mike], of [Mike’s Electric Stuff] fame. His PCB density was impressive, though he did admit to having a pick-and-place machine. Especially useful for those large LED matrices. 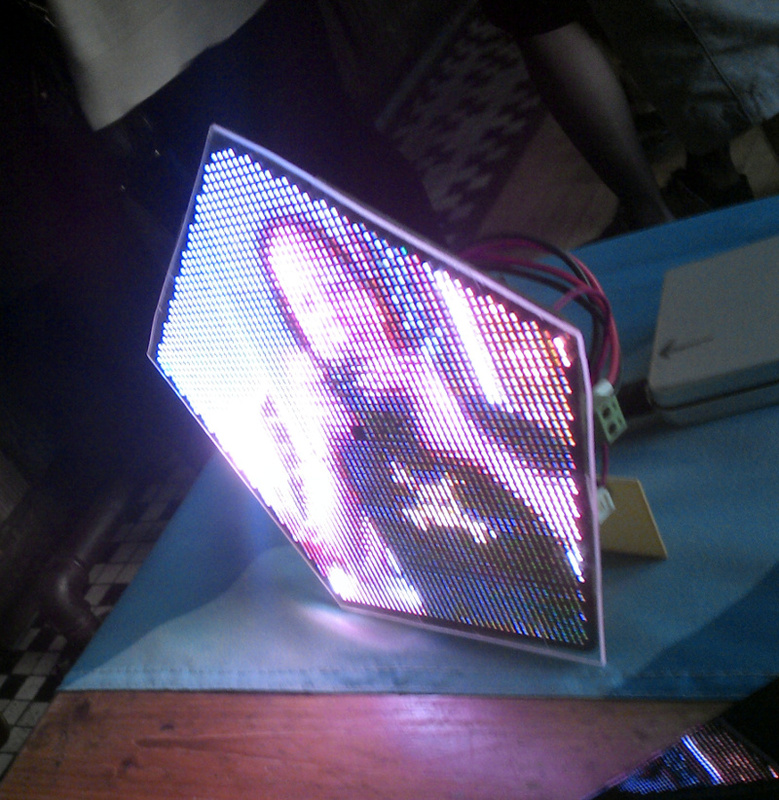 Of note was a pentagonal LED screen with integrated camera, originally part of an LED screen polyhedron. This board offered a rare glimpse of a Raspberry Pi Compute Module in the wild. Opposite me for most of the evening was [Leonerd], with his oscilloscope current probe adapter. This board as you might expect contains a very low value shunt resistor and an amplifier, allowing the accurate measurement of low current transients without laying down the GDP of a small country to buy one from a high-end test equipment manufacturer. I was party to a very interesting conversation between him and [Mike] on the subject of instrumentation amplifiers, something of personal interest from my experience with RF test equipment. Also present was [Spencer] with his RC2014 Z80-based computer. He’d brought along the fully tricked-out version with keyboard and screen, and had it running a fractal graphic generator written in BASIC. It’s a project that touches a spot in the heart of people of a certain age, if your first computer came from Sir Clive Sinclair then maybe you’ll understand. The value of the evening was not solely in the kits and projects on display though. Whenever you get a group from our wider community together in a convivial environment the creative discourse flows in unexpected direction, knowledge is shared, and new ideas are formed. Part of the global Hackaday and Tindie community got to know each other yesterday evening, and from that will come fresh projects. They may not necessarily change the world, but everything has to start somewhere. This event was one of a short series following our successful bring-a-hack at EMF Camp. We were very pleased to see the projects people brought along, they comprehensively eclipsed the little radio board that was my offering. The run of UK events isn’t over, we have ones coming up at Bletchley and Cambridge, and as always keep an eye on the Hackaday.io events page for global events within our community.